So this song has been in my head for a while now. I can’t even explain why, but it’s so damn catchy. And the idea that “this love is getting dangerous” is one that I can understand quite well. So enjoy. This song is brilliant on so many levels. And because of a rough day, I think that it might be my anthem for tonight. So enjoy. Also, have I mentioned that Lily Allen is my spirit animal? Ever since I heard Stevie McCrorie on “The Voice UK,” I fell in love with his voice because of its rawness and sincerity. There’s just something about the way in which he interprets songs that makes me really feel what it is that he is going for if that makes sense to anyone out there in blogland. His cover of “All I Want,” originally performed by Kodaline, is probably one of my favorites that he does. I hope you enjoy. Here’s another song by the really talented Luke Sital-Singh. The one is really intriguing, and I’m still trying to figure out exactly how I understand / read the song (It’s the English major in me). “Well, it’s been too long. No, it’s been too long, and it’s all my fault this time. I’m a long way back in the distance now, and I don’t know if I’m strong. On the darkest night when I told you lies for a chance I might seem cool, well, the ghosts were there roaming in their underwear, making me look like a fool. I find his poetry mesmerizing. I love the macabre, monsters, and other things like that. So it will come as no surprise upon hearing that Bryan Fuller of Pushing Daisies and Dead Like Me fame will be rebooting The Munsters (1964) on NBC as Mockingbird Lane. While Fuller himself admits that the show will be a reboot of sorts, he additionally allows that it will not be your parents’ (or grandparents’… I guess some people are old enough…) television show. Instead, the show will act as a revision to the previous source material (no neck bolts, Bela Lugosi costumes, etc.) and will build a new continuity. If you’re familiar with Fuller’s work, you will know that he has a knack for dark comedy and quirkiness that will be an added addition to the world of our favorite monsters. Moreover, his aesthetic will be wonderful when it comes to painting and creating the world that these favorites of ours will inhabit. Honestly, I’m excited to see what Fuller does with this series simply because I love his body of work and I loved the original version of the show from the 60s. While some of the casting choices seem a bit odd to me (*cough* Jerry O’Connell *cough*), I think that overall it’s a relatively strong cast. My overall favorite casting choice would be Eddie Izzard as Grandpa. To me, he is the right fit for the snarky and fun character that is Grandpa. . .Moreover, he’s a fabulous actor overall too. Anyway, here’s hoping that the final product is good. I know that I’ll be tuning in to see what happens. Still, I have faith in Fuller and the cast that has assembled (that feels like an Avengers joke… not intentional… but whatever). Here’s hoping that writing, filming, and editing goes well so that we’ll get to see this new gem in the fall. I await it with neck bared. For more information, check out this interview with Bryan Fuller by James Hibberd. I’ve been out and about looking at local thrift stores in my area, and I think that I’ve found some things that are a little creepier than anything that was in my last installment of Creepy Things from Thrift Stores. I hope that you’ve braced yourselves and prepared for what is here. The goods today come from a Thrift Mart that is very close to my apartment… needless to say, there was some pretty interesting things there. The third item probably takes the cake of all of the others. Matter-of-factly, I almost overlooked this item while I was browsing the shelves of this particular store. While I’m usually a fan of painted masks / Mardi Gras masks, this one is quite different from anything that I’ve ever seen. . .it’s a little odd to say the least. I made me feel unsettled a bit to be looking at it. So there you have it. Another edition of the Creepy Things from Thrift Stores. I hope that you haven’t been too disturbed… and who knows? Maybe someone will take pity upon these items and take them home with them. I recently had a Twitter conversation with author B. J. Keeton (@professorbeej on twitter. . .you should follow him if you don’t) and expressed how hard it is for me to write a review of anything because I feel like I can be a little too critical at times. I also told him that this is the reason why I hadn’t already written a review of his and Austin King’s Nimbus: A Steampunk Novel (Part One), and honestly, this is true. I have started and stopped writing my review several times, and each time, I have thought that I might be being a bit too hypercritical. However, as I have let the thoughts sit, I know that I enjoyed the book and look forward to reading it, and although the first part isn’t perfect, I really enjoyed it. Now, I’m going to tell you why as briefly, succinctly, and honestly as possible. NIMBUS: A STEAMPUNK NOVEL (PART ONE) is the first volume of a serialized steampunk fantasy novel that started as an experiment and came out of the authors’ desire to do something new and interesting with ebook technology, while also dealing with a wide variety of narrative goodies–from airships to demon possession. The story of NIMBUS: A STEAMPUNK NOVEL follows Jude Finley, a new recruit aboard the Gangly Dirigible, an airship that extracts water from rainclouds. Having only lived above the Skyline for a year, Jude is still getting used to the way things work in the world above the clouds. While working aboard the airship, Jude and his friends uncover a secret which may or may not help them against a growing uprising that could spell doom for everyone on the planet. 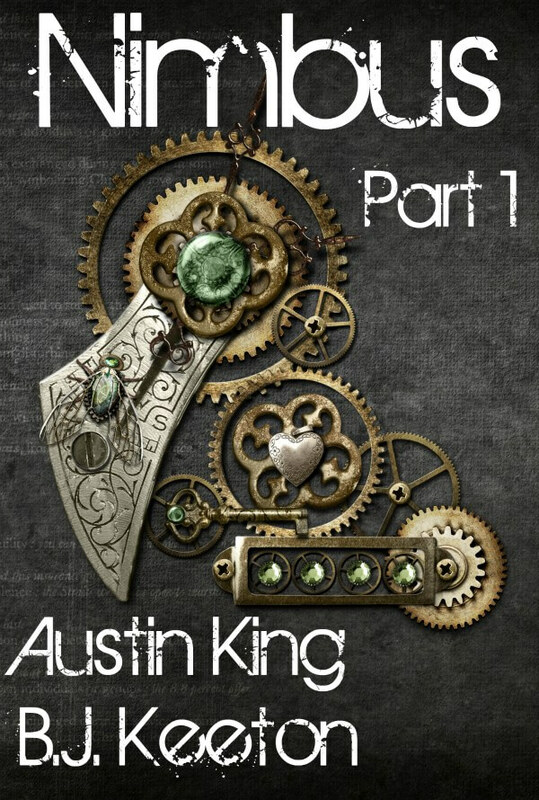 AUSTIN KING has written plays, poems, novels, and short fiction, but he spends most of his time making sure his credentials sound more impressive than they really are. Both of these guys are awesome as well! The characters– Both Jude Finley and Demetrius Rucca are fully fleshed out characters that I find to be completely believable. While both characters are interesting in their own right, Jude takes up the mantle of our main hero as he manages his life aboard the Gangly Dirigible and is confronted by increasingly difficult situations up until his cliffhanger. Rucca (as he is referred to throughout the novel) lives the life of a highborn crippled man, and it becomes obvious quickly that this has affected him as he literally takes to the skies to rid himself of his existence. Moreover, each has another hidden layer that surfaces as the story continues. . . The story– It’s original and unlike anything I’ve ever read before, but moreover, it puts a new spin on the steampunk genre, which can be dry for me at times. From the beginning, the readers are shown the importance of water and how difficult it is to gather in turn through Jude’s story. With Rucca, we are brought into the problems of someone stuck in his own skin, feeling the limitations and hoping to be able to bypass them somehow. And. . .AND it has demon possession which will serve as a huge plot device within the remaining parts. . .I find this to be really awesome. The Concept of Serialization–They’re releasing the novel in four parts on Amazon, but they’re also releasing it chapter by chapter on Keeton’s blog professorbeej.com. I’ve oftentimes thought of how interesting it would be to read something serially, like the Victorians once did (and others… I know that too). This indulges my fancy and allows me to see how it would function. Also, I think that this is a brilliant way to build suspense, especially with the overall strength of the writing. It makes the overall premise great. Imbalance with alternating plots early on– While the writing and the story were really, really strong overall, I found myself at times feeling like the alternating chapters between Jude and Rucca’s points of view were a bit uneven in terms of their overall pacing and interest level. This occurs mainly toward the beginning and slowly begins to work itself out as both plot lines amp up in terms of action. Give it the first few chapters, and I assure you that you will be drawn in (that’s why I make this point). Awkward phrasing at points– Although this doesn’t happen that often, there were a few times in this section of the novel that I was left scratching my head at the connection of ideas in a sentence or at just the structure of a sentence. For example, at one point there is discussion about a character that has been damaged by the fog: “His fingers, hands, and arms were also damaged. Muscle tissue and, like the spot on his right hand, even bone showed through.” I understand what was meant to be said here within the context of the larger scene; however, it took me reading this passage a few times to get the exact meaning. These types of issues occurred very infrequently, which shows you that the copy editing / proofreading was done with great care and attention to detail. I would give this book 4 out of 5 stars because it is provocative, the concept is interesting, and the characters, especially the main ones, are well written. I enjoyed it thoroughly and anxiously await the second part to know what happened to both our hero and the budding villain. Honestly, it is pretty fantastic for only 2.99 at the Amazon Kindle Store. Go out and get it today!